A couple of weeks ago, I started feeling edgy on our deck – one of my favorite places in this world. Almost everything is in order out there like prior years. The Himalayan poppies are blooming in the yard. The badminton net is being worked over by a moose yearling. The little swallows just fledged under our eves. All is good. The only real addition to our outside equation is the propane grill. As in the heat source to cook that succulent Alaskan salmon, husband-freshly-caught halibut, and some chicken dogs from Costco (not as glamorous as the first two). About 5 years ago, our last grill went to the dump in disrepair. We never replaced it until now. And there on our deck, it sits in its shininess. And maybe smelliness. It seems to be calling in the critters. 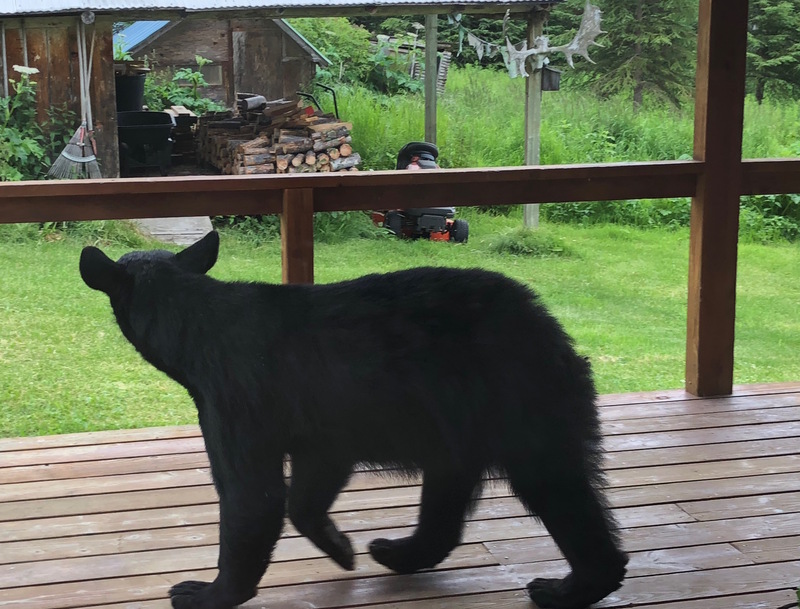 In the last couple weeks, I’ve viewed a few different bears hovering on or near our deck sniffing around the grill. 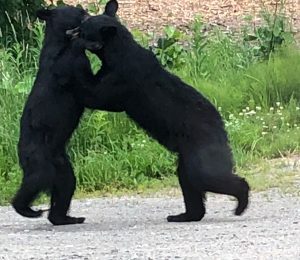 One evening, I pounded on the window safely from inside — with the bear’s head about a foot away from it. His response was non-vibratory. As in. Didn’t. Move. A. Muscle. Oh no, I thought in dismay. He has a hearing impairment! Right #*& And so we are back at the start; I’m a bit edgy. You could call it hyper-vigilant. I’m strapped up with bear spray out there. Whether I’m watering the plants, weeding the delphiniums, or working onmy laptop. Trouble is that spray only lasts 7 to 9 seconds full out. OK, I’ve jumped into the fight-or flight. Truthfully, flight. In the workplace, we are looking for safety too but hopefully of a different kind. Most of us are on the hunt for a rewarding work experience, collaborative colleagues, work that matters, and a fair, respectful workplace. Psychological safety. All of us are looking for psychological safety. It’s the human in us. Your team leader won’t call you out as an under-par performer in the presence of your coworkers. Your colleague won’t convert the sound of your sneeze into ridicule throughout the office. Your supervisor won’t penalize you for being a different skin color than hers. Your intern won’t exhale a big sigh after you explain the email practices of your agency. Or in proactive terms, it means you feel socially safe in your workplace to take risks and be your best professional self. It means being OK with admitting your mistakes, asking a question, offering a new idea, or challenging the status quo in a respectful, tactful manner. It means being vulnerable with your colleagues (I’m not talking TM[personal]I here) without the worry of detrimental consequences. It means being safe enough to be human in the workplace. How Do You Build More Psychological Safety in Your Workplace? It’s sort of like bear protection. I can use bear spray but going upstream to identify the problem is more effective. On our deck, it means cleaning the grill each and every time after use. In your case, it means looking at your organizational practices and culture to boost up staff trust and safety. One of the best starting points in building a platform of psychological safety in the workplace is ensuring fairness. If you didn’t see this 3-minute video on mammalian unfairness last month, don’t miss it. Unfairness brings out the fight-and-flight in all of us. And once threat is triggered and persists in your workplace, you will face mistrust, disengaged and disgruntled employees. And in turn, an organization that doesn’t flourish. Gallup found that when employees perceive they are “often treated unfairly at work, they are 2.3 times more likely to experience a high level of burnout.” Burnout is costly. Most of us have experienced leaders playing favorites, or missed out on important information about our team’s tasks, or were clueless how an impactful decision got made about our job responsibilities. Creating a platform of psychological safety by upholding fairness in your organization takes planning. And then, takes the effort of embedding and enacting these practices. It’s worth it. Meanwhile, I’ve got my bucket. My water. Soap. Rag and broom. And after our grilled king salmon last night, I’m scrubbing and sweeping out there. It’s worth it. Perhaps if I’m vigilant upfront, my nervous system won’t need to be so vigilant scanning for that next hearing-impaired bear. After all, we mammals are looking for safety. 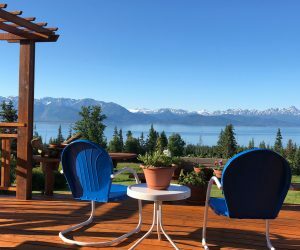 It’s the Apex of Summer in Homer Alaska! May you enjoy it wherever you call home.